This face oil looks really nice. Just for info, " essentielle majeure" is not something we would say and write at all in french. The combination of these 2 words is not "adequate". Instead, the correct way to say it would have been "la plus essentielle". I have noticed lots of beauty compagnies want to use french words whch is great but they should really check with a french native person before as I come accross many mistakes. Not bid deal at all ( my english is not perfect at all), but when it comes to decide for a product mame, I do think it matters then. 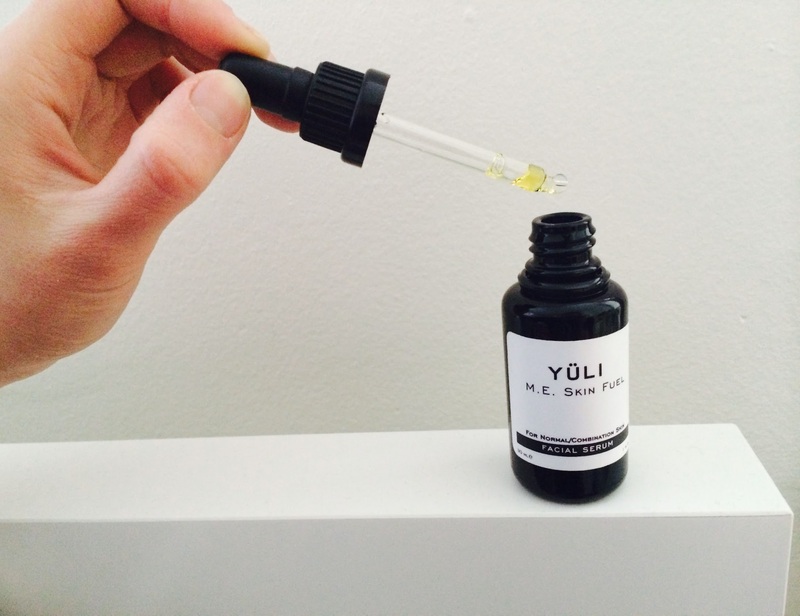 I love yuli skincare by the way and your blog too! Mmmm, I love how M.E. Skin Fuel's ingredient list reads like poetry! Red raspberry oil, broccoli seed oil, jasmine…yum! Also you are totally right about how some serums are more balancing for your skin than others. In my facial oil-newbie days, I kept on using this one particular serum even though my face clearly didn't like it (acne galore!). The one I'm using right now (Meow Meow Tweet) is great for my skin and is very balancing. You should totally be a Yuli ambassador! Do you use this mainly in the day? Currently I'm LOVING MLS the youth dew. Once my pockets have recovered I'd love to get some samples of Yuli! Thanks for reading and the love Audrey! That is really interesting about the grammar–I studied French in high school and continue to love it even though I'm not formally taking classes in it anymore. I can't speak for YÜLI formally since I don't represent them, but I'm sure they meant no harm. Lucky you! I think and hope your skin will love it, behaving or misbehaving (goodness forbid)! Heh, my heart jumped when they announced an internship program, but my school was not included. For now, I remain an avid fan! I forgot to mention specific application details–thanks for reminding me! I will add that in, but yes, I mainly used 3 drops of this in the day since I used Cell Perfecto PM at night. Sometimes when Cell Perfecto PM didn't feel enough at night, I would layer this on. Lucky you!! I share the same thrill and wish 🙂 Hope ME Skin Fuel continues to fight those chin zits away! I know, right???? Absolutely delicious! Glad MMT's oil is working for you–I have a little sample that came with an order that I haven't used yet, but it has been boy-approved. Looking forward to putting it on my mug! I got this as a sample from SBL a few days ago and I'm so excited about it. Maybe it's not an active blemish fighter but my big painful chin zits aren't cropping up one after another like they usually do. Basically thrilled with Yuli's line in general, just wish I made more money! Oh my.. the ingredients are indeed a dreamy mix of flowers and power herbs, no wonder they call this skin fuel! I got this just last week and then scent is VERY "jasminey" but not heady or suffocating. It isn't like their Pure mask in attacking blemishes and I know it isn't a spot treatment like Osmia's by any means but I feel like my skin is more balanced, less cystic acne and no dryness during the day. This oil might have been made for me! Definitely agree with your comparisons with Pure and Osmia. So glad to hear it's working well for you! I adore this serum too. I have dry but breakout prone skin and it moisturises nicely. Love the spicey/honey-jasmine scent and the fact that it is free of essential oils. Love it. Btw i use liquid courage as daytime serum; i also find it light and well absorbing and it moisturises well. I think you'd like it. Ooh, love to hear you love Skin Fuel and Liquid Courage. It's on my list to try!